Congress recently passed a sweeping tax reform bill that is expected to fundamentally alter the U.S. tax code. President Trump signed the bill into law, codifying the $1.5 trillion dollar package of reforms. In addition to altering the structure of both the corporate and personal tax codes, the bill is expected to have a far reaching impact on the municipal market. We believe this impact will be primarily focused on the areas of private activity bonds, advanced refundings, corporate demand for munis, and specialty state bonds. Private activity bonds are bonds issued for 501(c)(3) entities such as hospitals, private colleges, airports, charter schools, and P3 (Public Private Partnership) projects. In earlier drafts of the tax bill, congress had proposed the elimination of these bonds due to concerns over wealthy private entities receiving tax-exempt financing benefits. Despite this, the final version of the bill left this area of the market unscathed, allowing unrestricted continued issuance. Going forward, investors must remain vigilant as private activity bonds may come under further scrutiny should talk of infrastructure spending return. Nonetheless, preserving this sector of the market is a positive for investors as these deals often present solid potential opportunities to pick up yield or find credits that are mispriced. The Tax Cuts and Jobs Act also lowers the corporate tax rate to 21% from 35%. Currently, banks and insurance companies hold approximately 29% of all municipal debt; however the tax bill could decrease their appetite to own munis given a decline in the value of the tax exemption. In practice, many companies have already been paying a tax rate far lower than the stated 35% and thus the decrease in demand may be more muted than some have suggested. Overall, we expect that this provision will decrease corporate demand for municipal bonds, though the overall impact on the market could remain moderate. For individuals, the top personal tax rate is dropping from 39.6% to 37% and the state and local tax deduction (SALT) will be limited to $10,000 from property, income, or sales taxes. 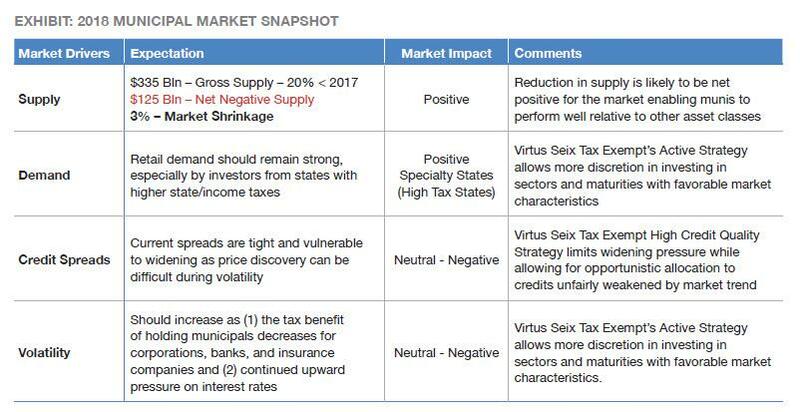 The reduction in the top tax rate should not have a material impact on the market given the rate reduction was small and we expect that investors in this bracket will continue to have strong demand for munis. The changes to the SALT deduction will have a large impact on residents of high tax states such as California, New Jersey, New York, and Connecticut, substantially increasing their effective federal tax rates. Because of this increase, we expect to see additional demand from high net worth investors in these states seeking to shield more of their income from federal taxes, which could lead to outperformance for bonds from these states. Overall, we believe that there will be a significant impact on the municipal market from the tax bill. A net decrease in supply, a decrease in corporate demand, lower coupon bonds, and strong performance by debt from high tax states should all be expected to materialize over the next year. Taken in concert, we believe that municipal bonds will remain a strong component of the investable portfolio for high-net-worth individuals and that this may be an attractive entry point given expected increase in volatility next year. The Funds are the successors of the former RidgeWorth Funds, which carried substantially the same names, investment objectives, and strategies, as a result of their reorganization with and into the Funds on July 14, 2017. Bonds: Offer a relatively stable level of income, although bond prices will fluctuate providing the potential for principal gain or loss. Intermediate-term, higher-quality bonds generally offer less risk than longer-term bonds and a lower rate of return. Generally, a fund’s fixed income securities will decrease in value if interest rates rise and vice versa. Prospectus: For additional information on risks, please see the fund’s prospectus. Not insured by FDIC/NCUSIF or any federal government agency. No bank guarantee. Not a deposit. May lose value.